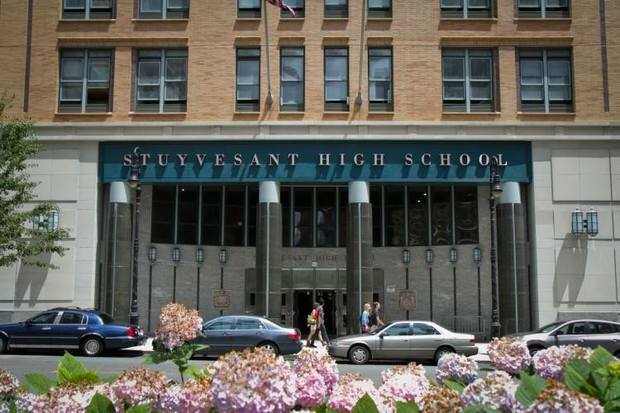 Specialized high schools include Stuyvesant, Bronx Science and Brooklyn Tech. MANHATTAN — In order to end racial disparities at the most selective public high schools, a new study calls on the city to dramatically change how students are admitted by potentially throwing out the standard admissions test and instead accept the top 10 percent of students from all middle schools citywide. A study from NYU’s Metro Center for Research on Equity and the Transformation of School released this week suggests that factors such as race and socioeconomic status should be considered in the admissions process for the city's nine most elite high schools, which include Stuyvesant and Bronx Science. The specialized schools are “grossly overrepresented” by Asian, white and more economically advantaged students, the report said, calling such schools “opportunity monopolies” that provide “excessive privileges” for certain groups. Currently, admission to the top schools is based on the Specialized High Schools Admission Test, which was administered this past weekend. Despite the DOE's focus on adding test prep for low-income students and piloting in-school testing at some schools, the demographics of those passing the exam last year remained virtually unchanged from the year before. Fewer than 4 percent of offers were given to black students, and Latino students were awarded 6.5 percent of the offers. Only one black student and eight Latino students were among the 339 offers for freshmen seats at Staten Island Tech, for example, and of 926 offers made by Stuyvesant, only 13 went to black students and 28 to Latino students. Of the 1.1 million students in NYC public schools, 40 percent are Latino, 26.5 percent are black, 16 percent are Asian and 15 percent are white. One hurdle to changing the exam for Stuyvesant, Bronx Science and Brooklyn Tech — the original specialized schools chartered through state legislation — is that it would require Albany's approval. Previous debates on changing the admissions criteria have included using multiple measures beyond the test, such as grades and letters of recommendation. That proved contentious, and a mayor-appointed task force charged with re-thinking admissions to top-notch schools stalled after another NYU research center found that the student body would barely change. The new report also calls for recruiting and retaining teachers of color, something Schools Chancellor Carmen Fariña has said she is focusing on. According to a recent report from the Education Trust-New York, while roughly 65 percent of the city's public school students are black and Latino, only about a third of teachers are black and Latino. Moreover, 2 percent of the city's black students and 2 percent of Latino students — more than 10,000 children — attend schools with no teachers of their own race, while 2 percent of white students — roughly 2,700 — attend schools with no black or Latino teachers. It would not make much difference, Kirkland suggested, if the specialized high schools admissions changed but the teaching force did not. Though policies like the one suggested in the new report exist at the university level in Texas, for example, such a system on the high school level would be innovative, he said. Kirkland used an analogy comparing schools to baseball teams, saying that certain schools are on steroids — offering an enhanced curriculum and wealth of material resources — while others are left on the bench. The Metro Center, which focuses on issues related to educational equity, did not exclusively look at the specialized schools, but compared student outcomes from the city’s most and least diverse schools. It identified the 109 most diverse schools in the city, with student populations of between 50 and 75 percent black and Latino students. It found 839 schools that met its criteria for being the “least diverse,” with student populations between 76 to 100 percent black and Latino or more than 50 percent white, and with either very high or very low economic needs. An analysis of the 2015-'16 achievement data for these schools suggests that there was a link between modest academic benefits and increased school diversity. When looking at graduation rates in diverse schools, black students and white students were essentially the same. In the least diverse schools, there was a 23 percent gap between the two groups.